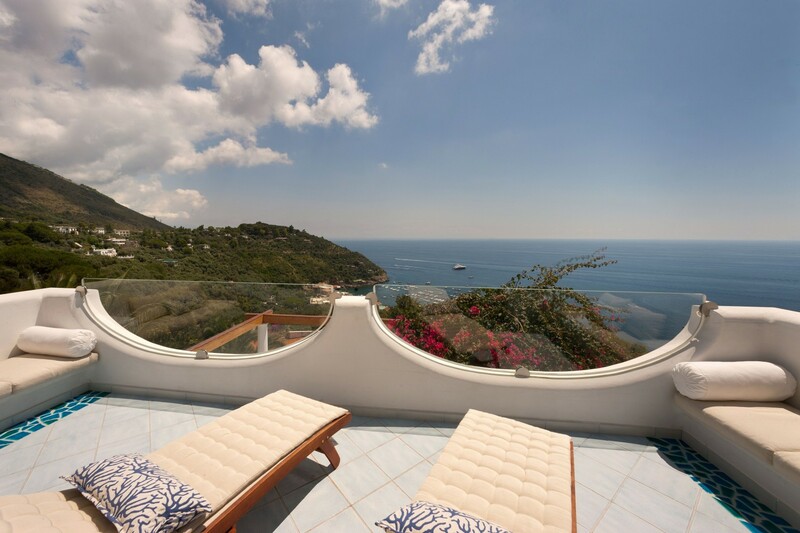 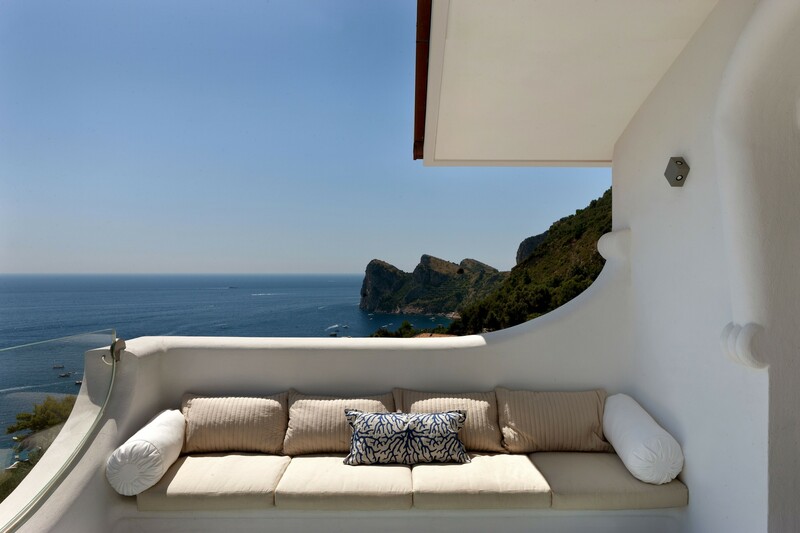 Villa Ulisse is a modern and luminous three-story villa, facing the sun and the sea, occupying a panoramic position overlooking the bay of Marina del Cantone. 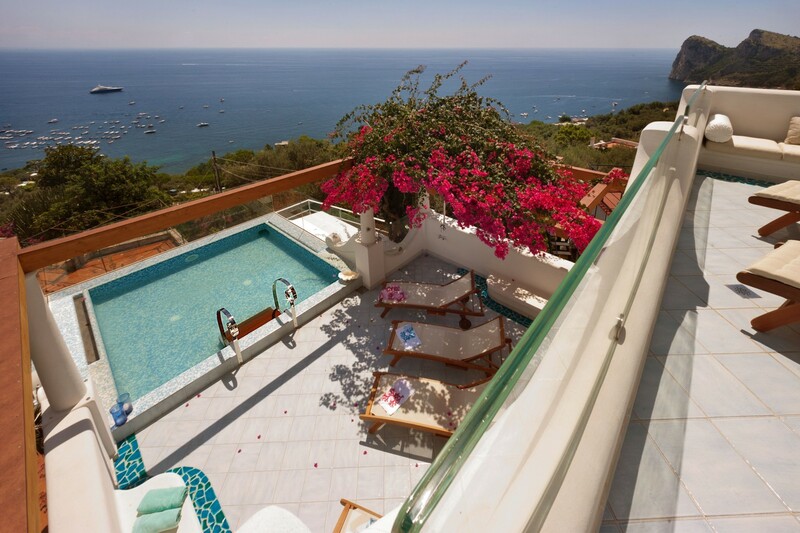 The property features two private swimming pool, two panoramic private terraces with a view of the sea, an outdoor kitchen and a private patio. 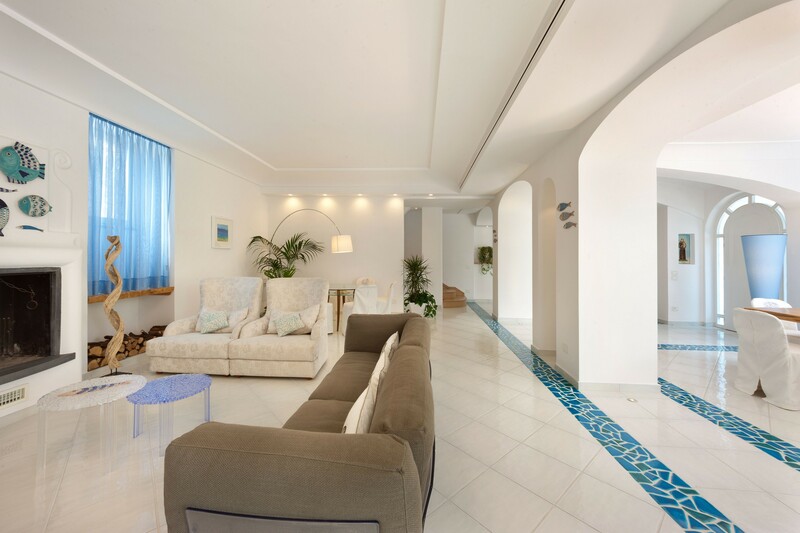 On the first and second floor 5 beautiful and spacious double bedrooms. 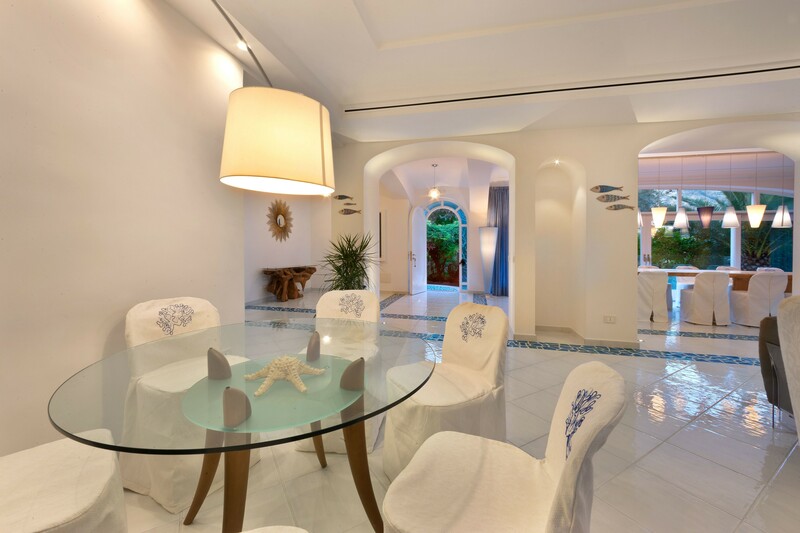 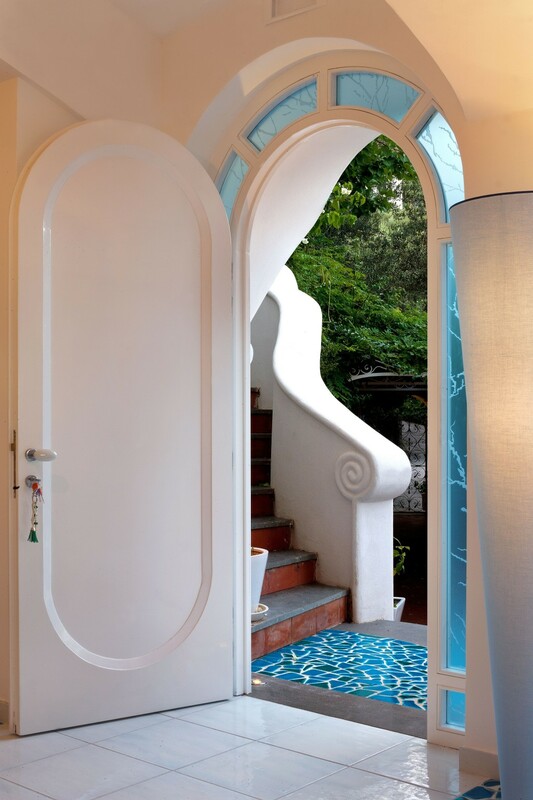 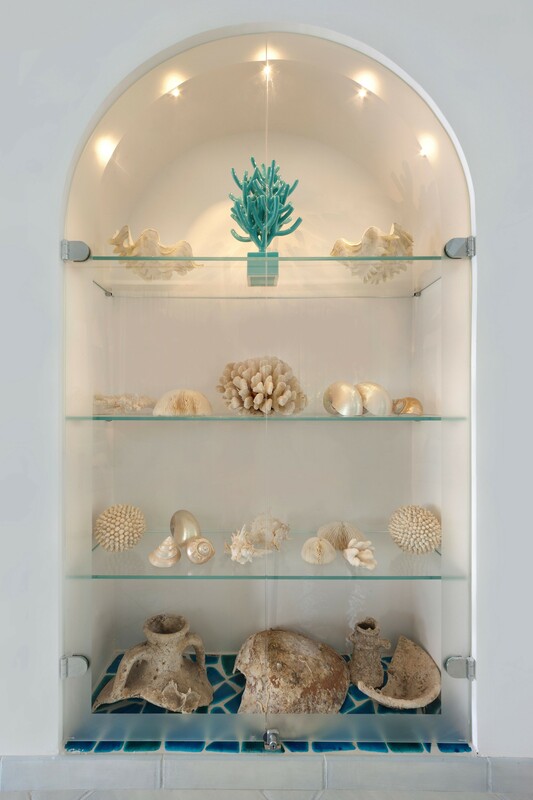 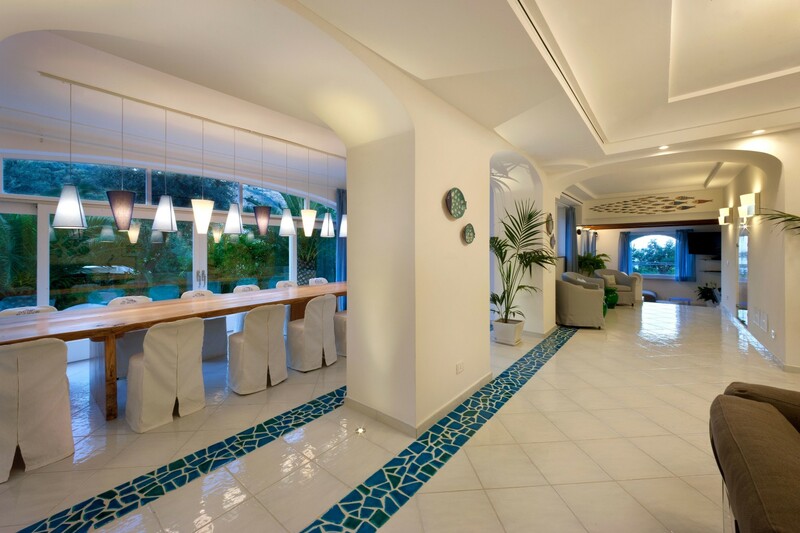 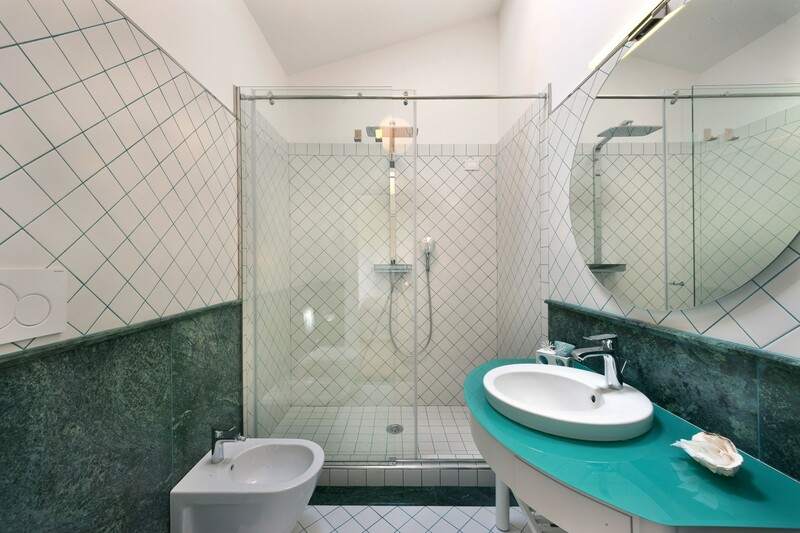 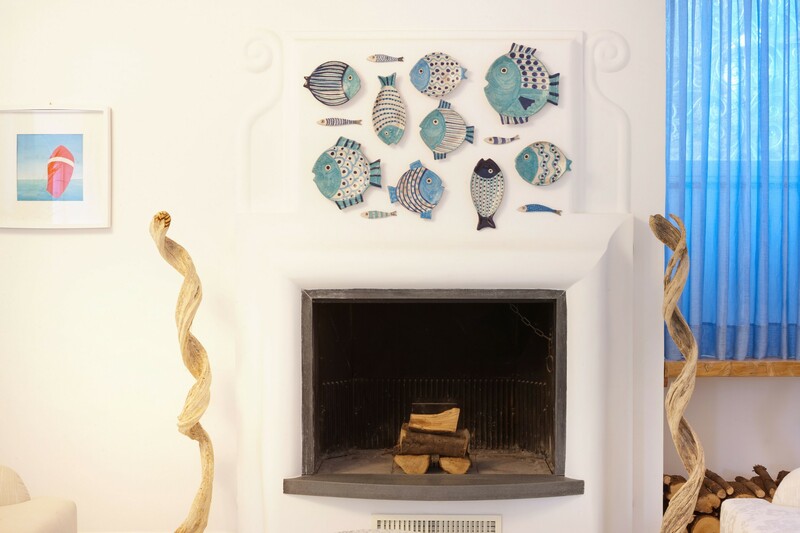 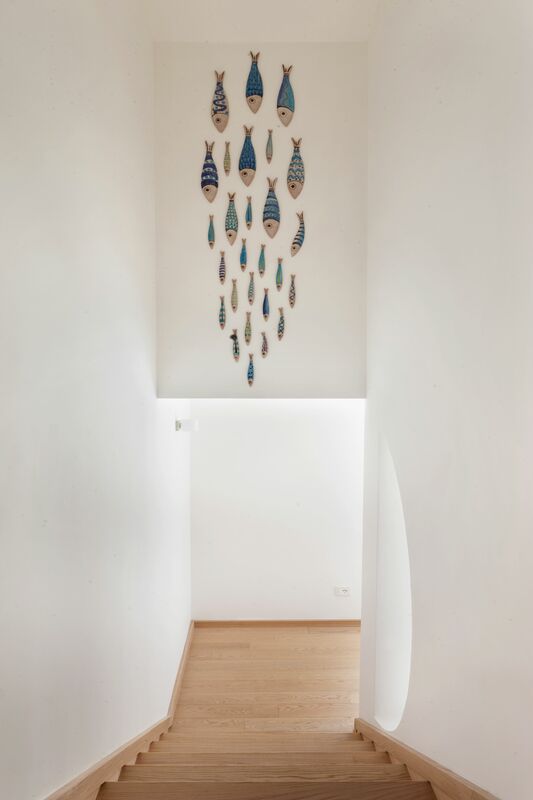 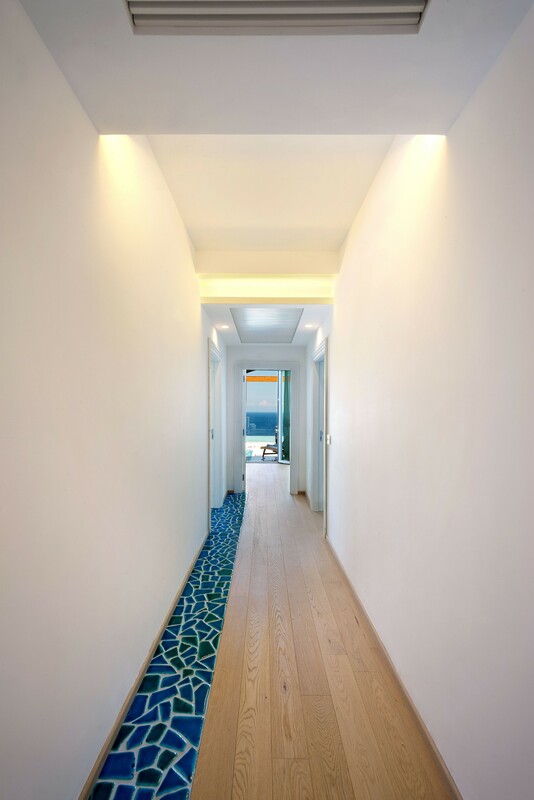 The property is paved with refined parquet floors, antique handmade tiles characterized by a type of ceramics called “Cerasarda Blue” in the characteristic style of the Amalfi Coast. 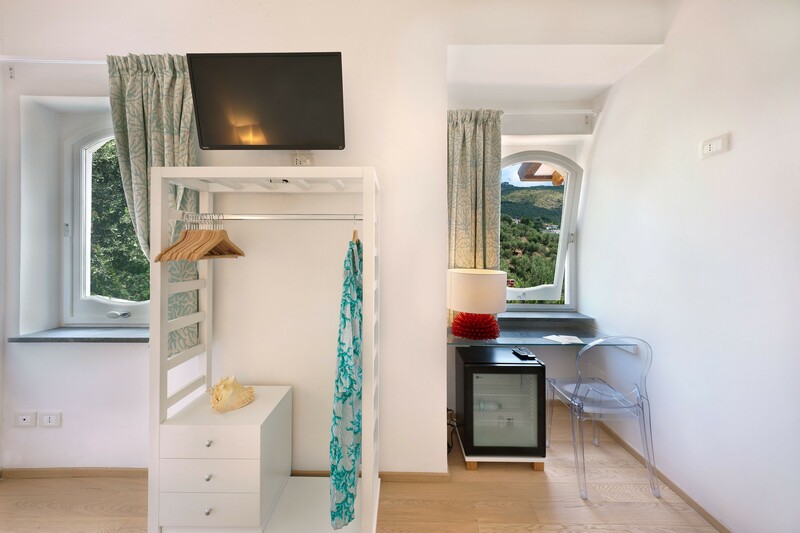 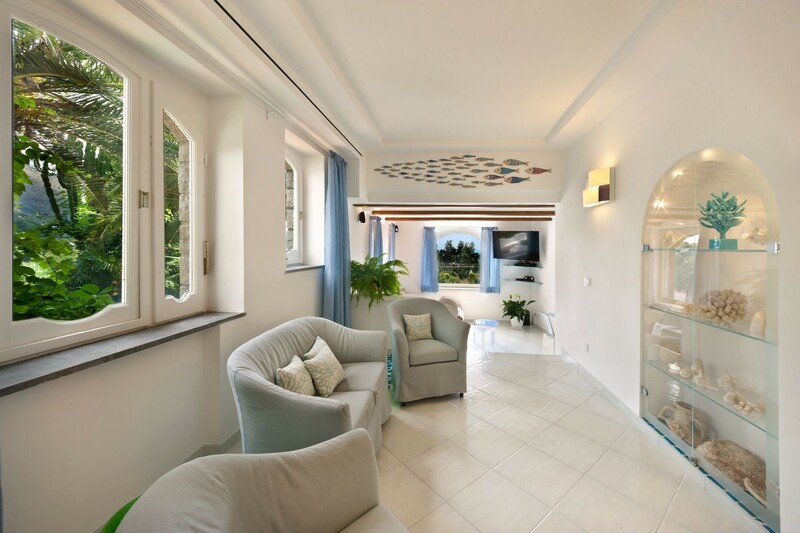 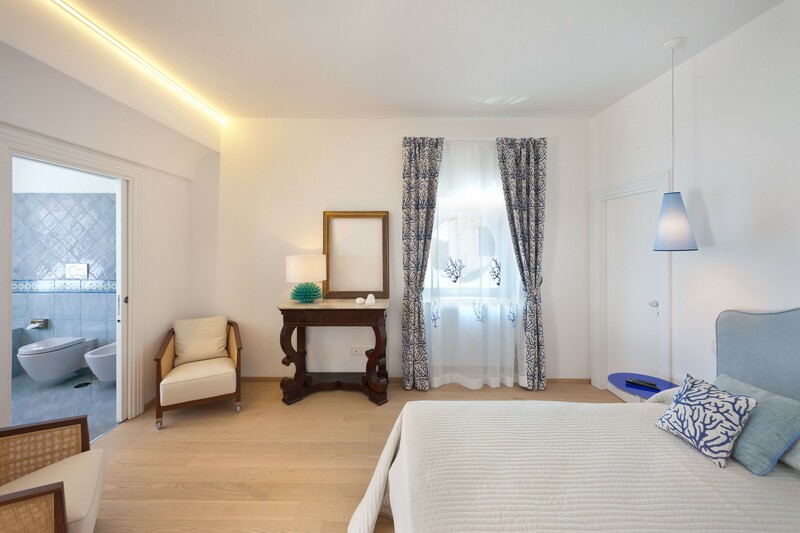 Villa Ulisse has been tastefully furnished: Wi-Fi Internet, air conditioning (all rooms), dishwasher, washing machine, and dryer, satellite TV, and safes in several bedrooms. 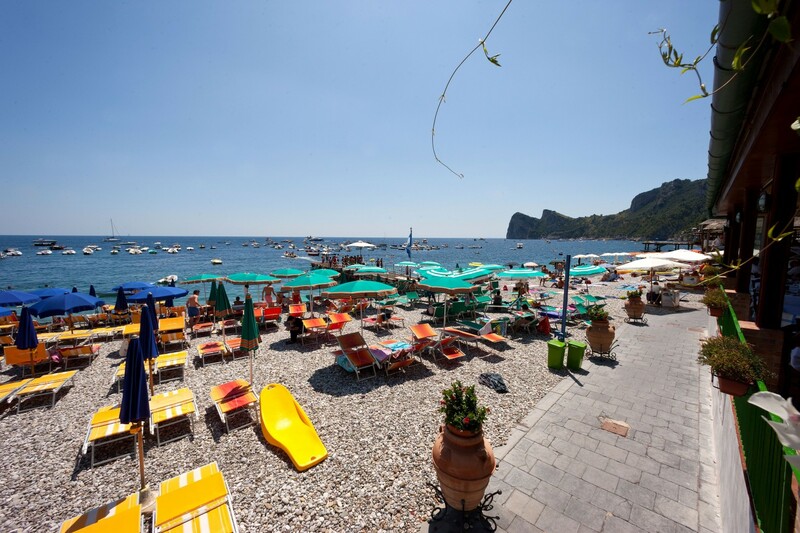 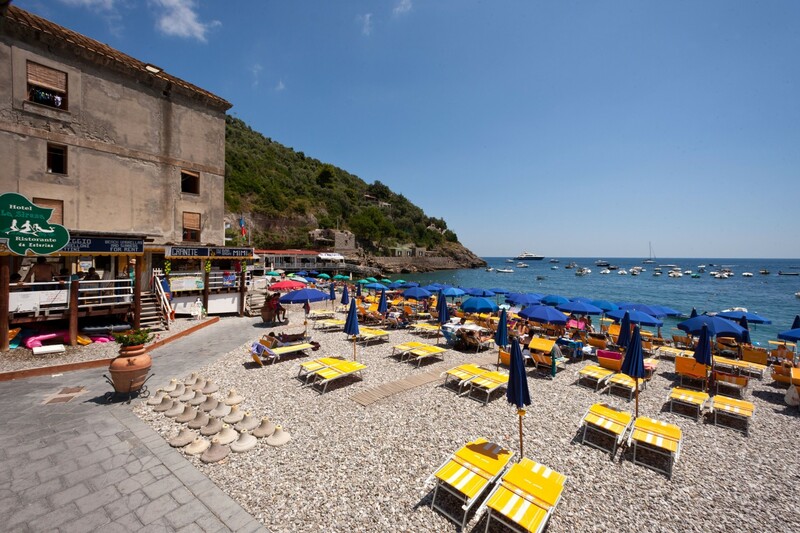 Marina Del Cantone is situated between the Bay of Recommone and the Bay of Ieranto (a naturally protected area) near Sorrento, Positano, Amalfi and Capri Island, and a short distance from Pompeii. 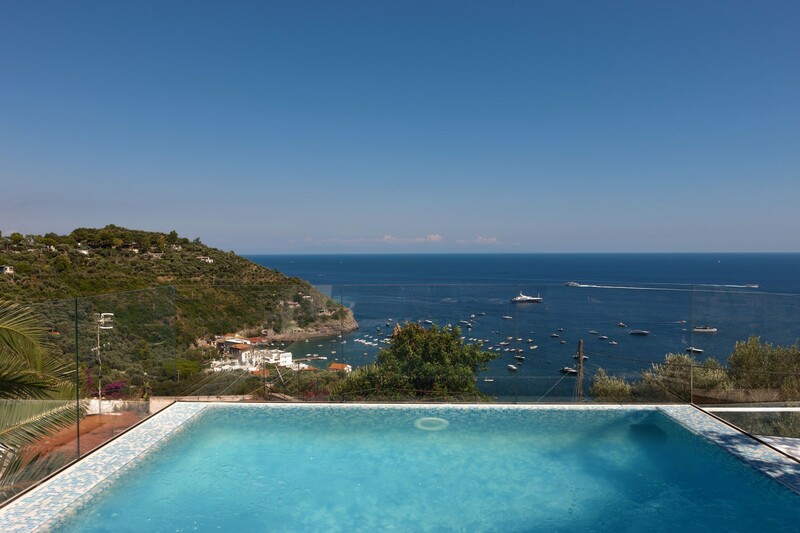 Villa Ulisse is a recently renovated, modern and luxury villa, located no more than a ten-minute walk from the beach, through a scenic trail along which you will find a coast guard tower dating back to the XV century. 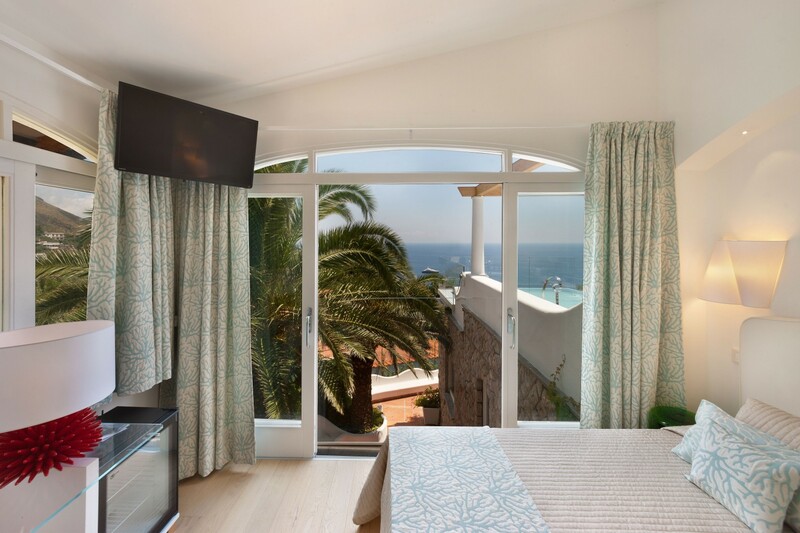 Room 1: double bedroom with sea views, queen sized bed, en-suite bathroom (double sink, Jacuzzi tub and hand-held shower), air conditioning, mini-bar, TV and safe. 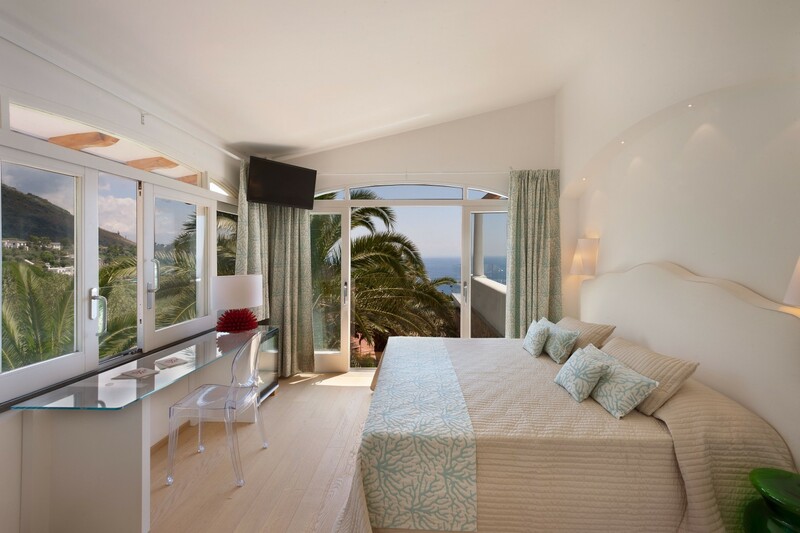 Room 2: double bedroom with sea views, queen sized bed, en-suite bathroom (shower), air conditioning, mini-bar and safe. 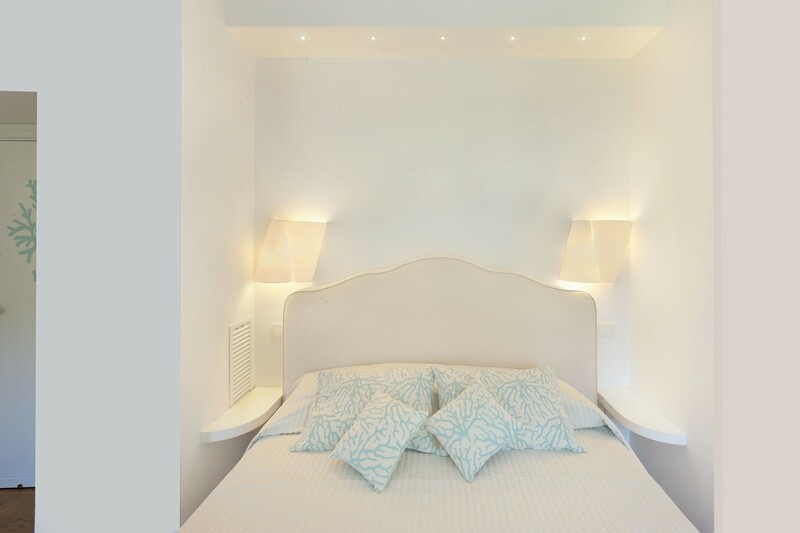 Room 3: double bedroom with garden views, queen sized bed, en-suite bathroom (chromo-therapy whirlpool), air conditioning, mini-bar and safe. 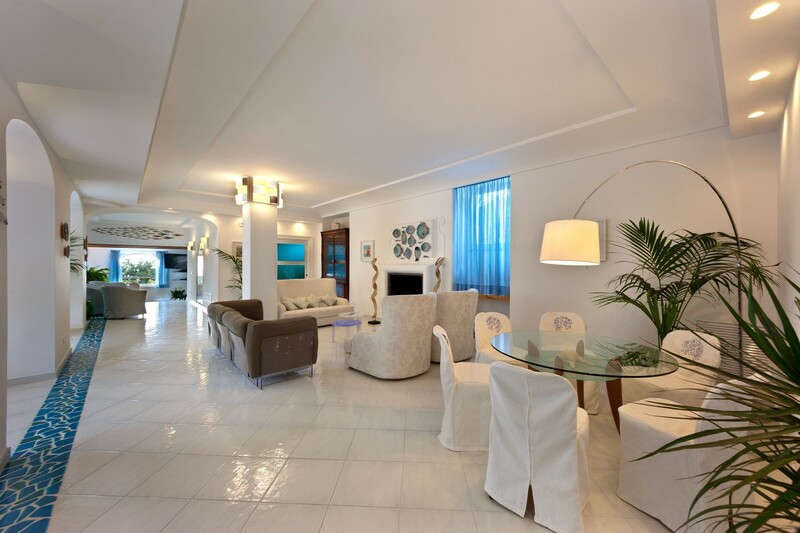 Lounge area with sofa and access to a terrace with infinity small-pool with hydro-massage (4m x 3.80 m, 70 cm deep). 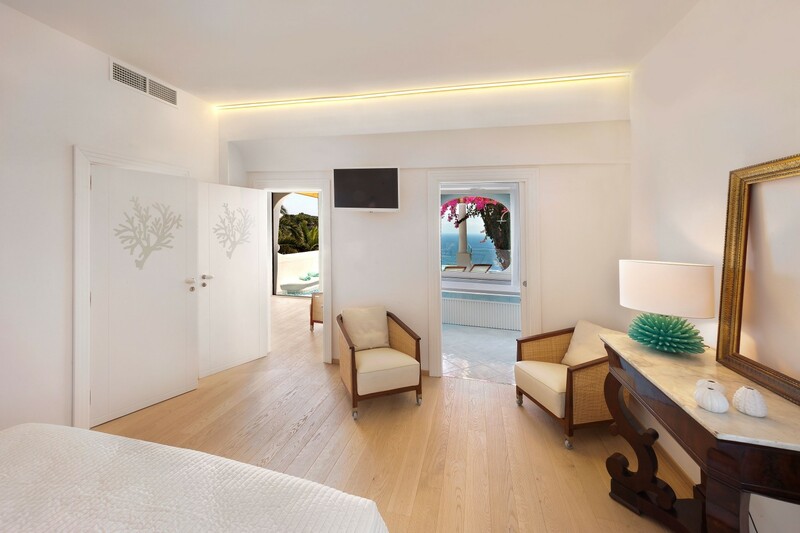 Room 4: double bedroom with sea views, king sized bed, en-suite bathroom (shower), balcony, air conditioning, mini-bar and safe. 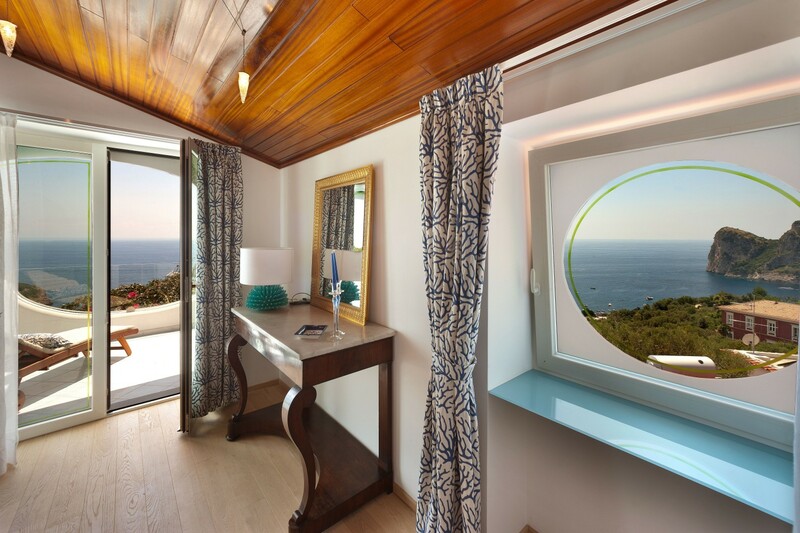 Room 5: double bedroom with garden views, queen sized bed, en-suite bathroom (shower), air conditioning, mini-bar and safe. 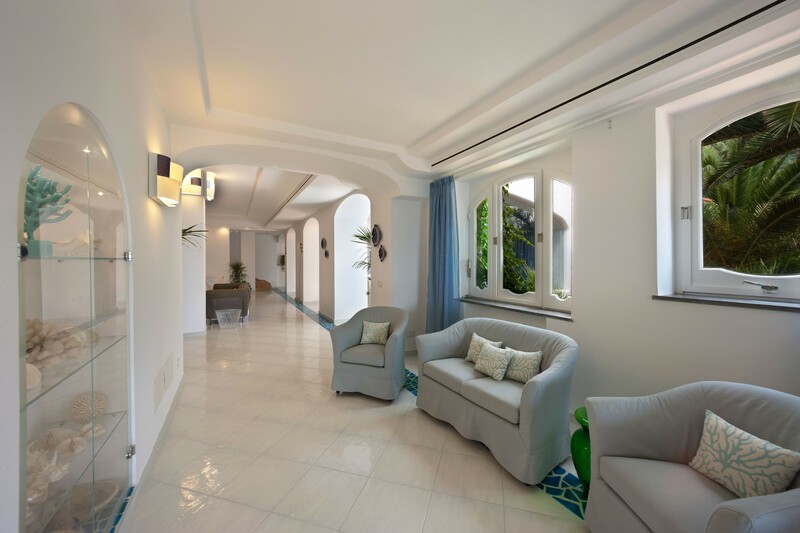 On the ground floor you will find an elegant large hall that opens onto the living room equipped with a fireplace, three sofas and four armchairs. 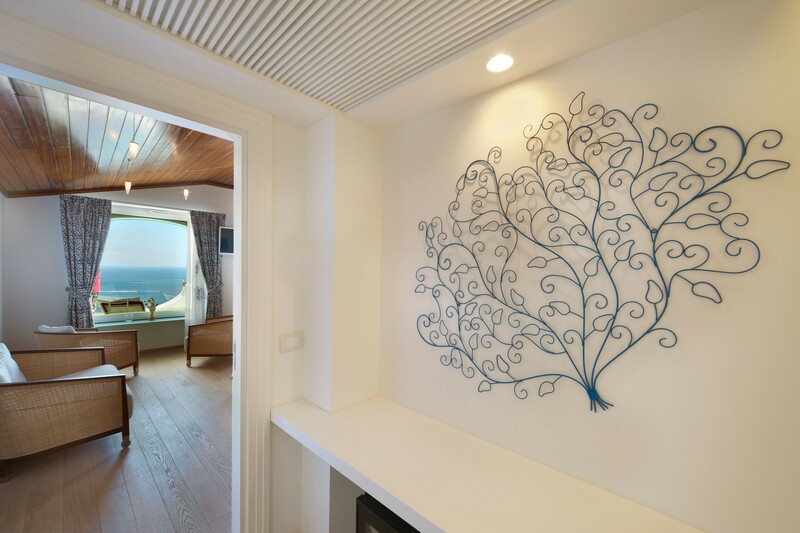 There is a TV area with a high-tech television, Bose Dock Station, and Satellite TV. 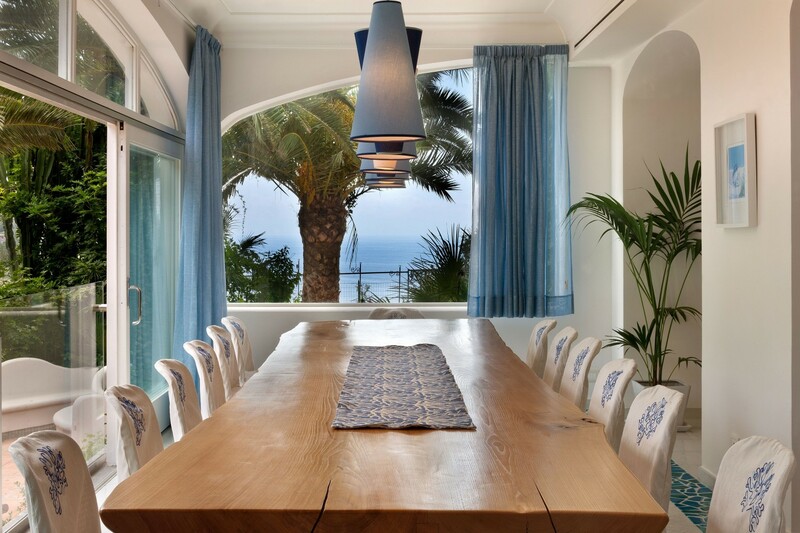 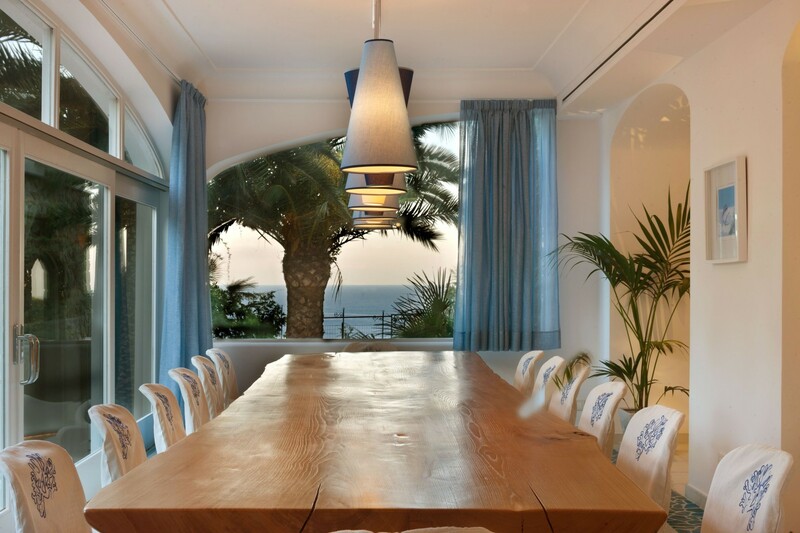 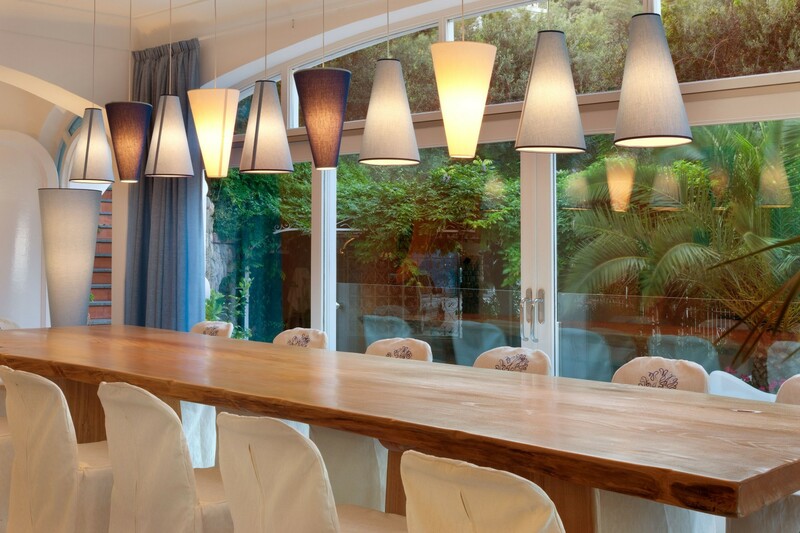 The dining room area can accommodate 14 guests and enjoys a double-glazed, large panoramic window. 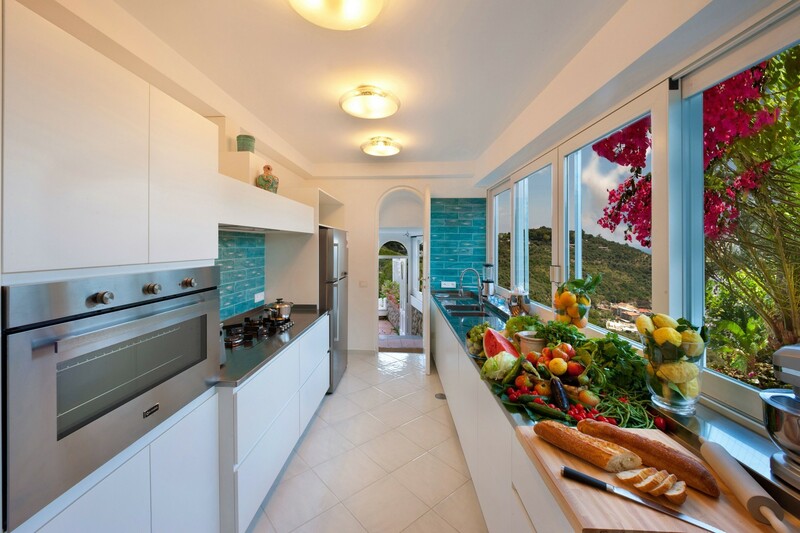 The modern kitchen is equipped with a four-burner gas cooker, a large electric oven, a refrigerator with freezer, and professional equipment such as a dishwasher, a microwave oven, an Italian and American-style coffee maker, icemaker machine, a toaster, and other small professional appliances. 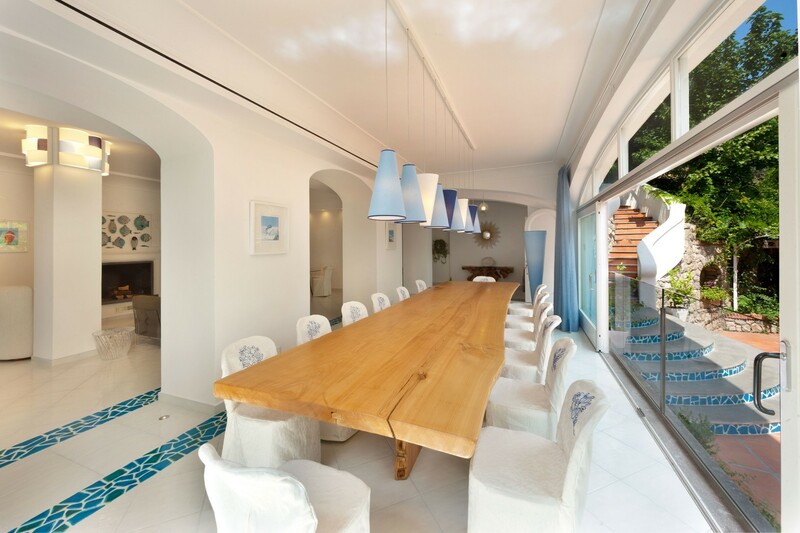 From the kitchen, a French door will take you to the patio. 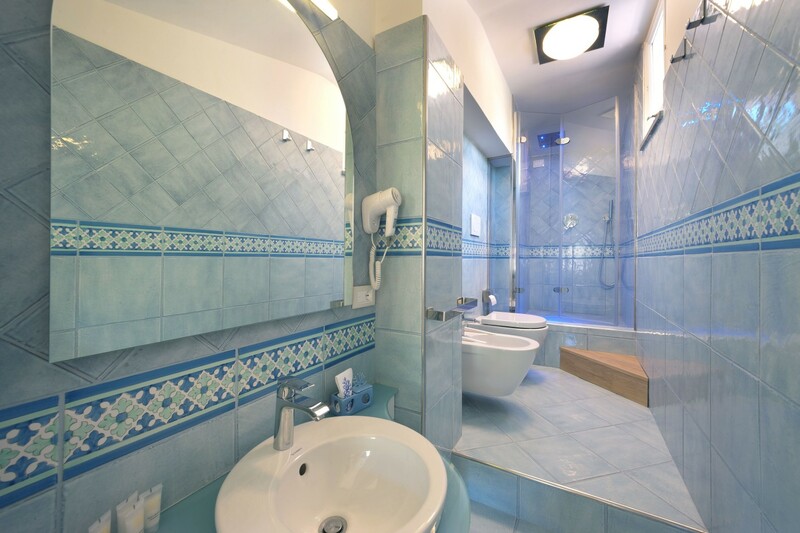 A half bathroom with laundry service (washing machine, clothes dryer, an iron and an ironing board) is also located on this floor. 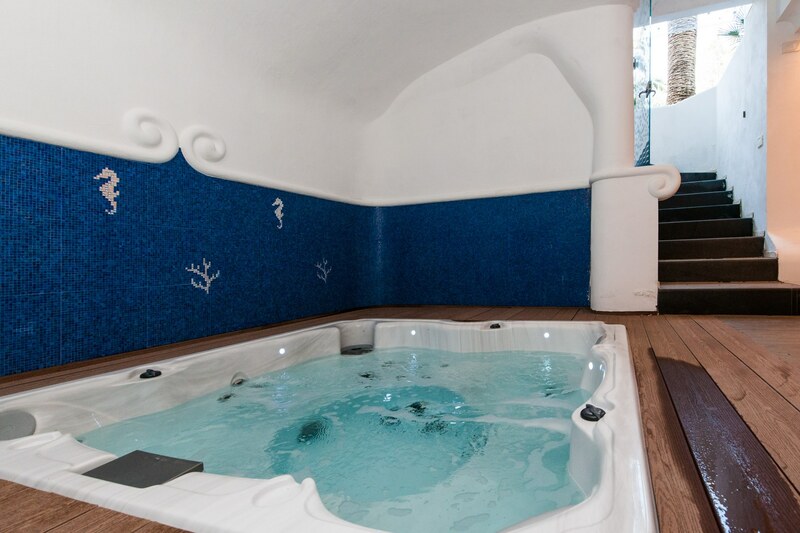 The first floor, up 18 steps from the ground floor and main entrance hall, boasts three double bedrooms, each with an en-suite bathroom, one of which enjoys a Chroma-therapy bathtub with hydro-massage. 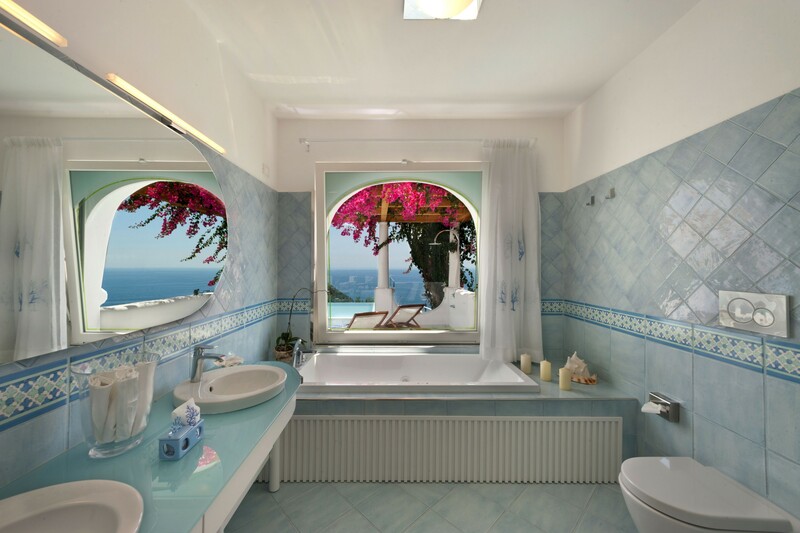 The other two bathrooms enjoy showers. 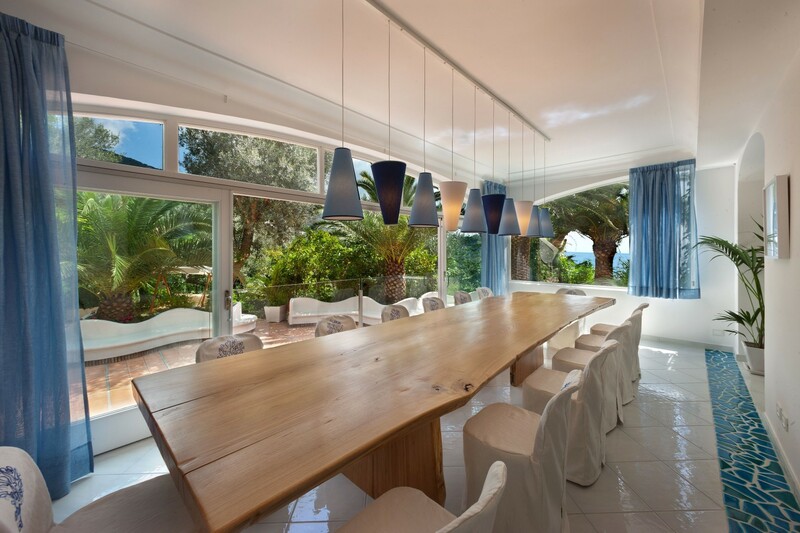 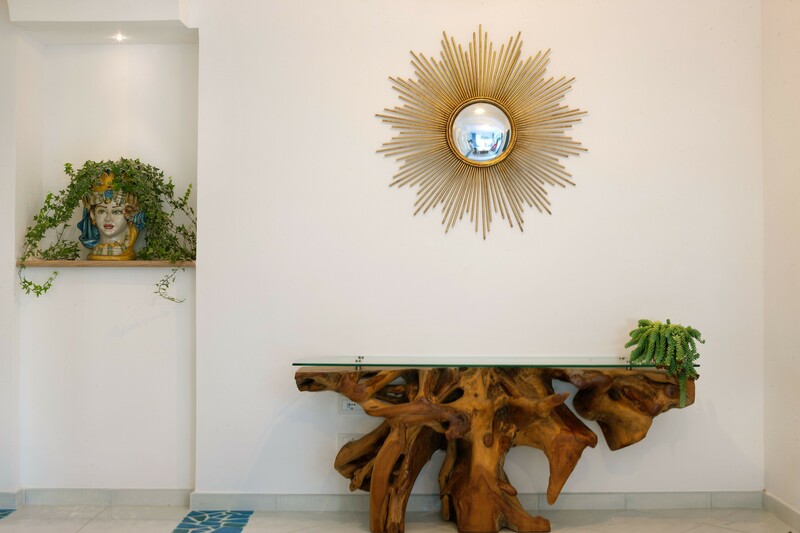 The furnishings include armchairs, desks, Satellite television, and air conditioning/heating units. 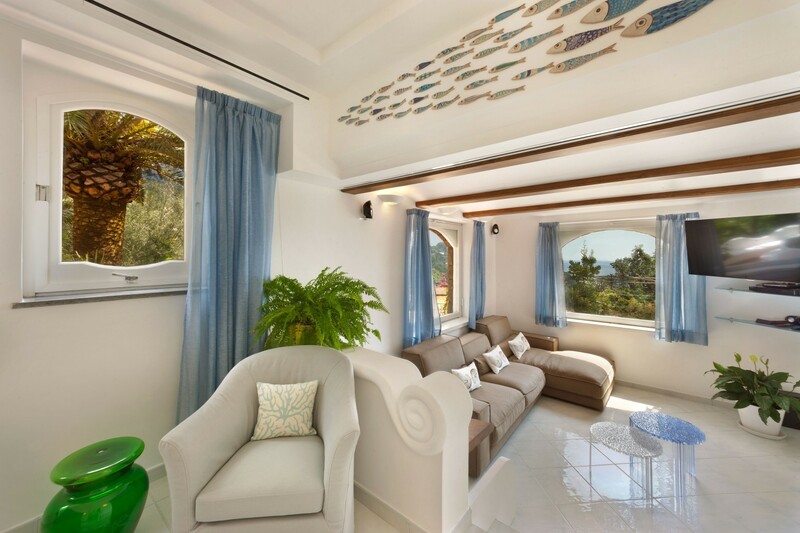 There is a lounge area with sofa and access to the sun terrace (30 sq. 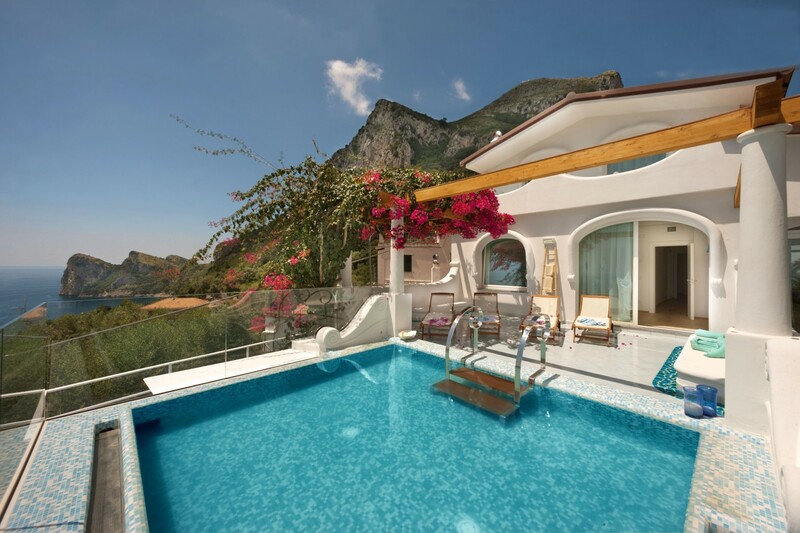 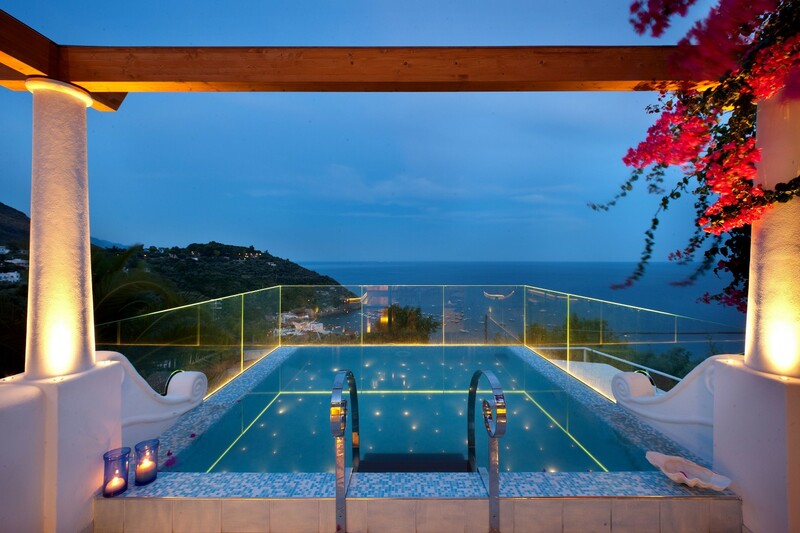 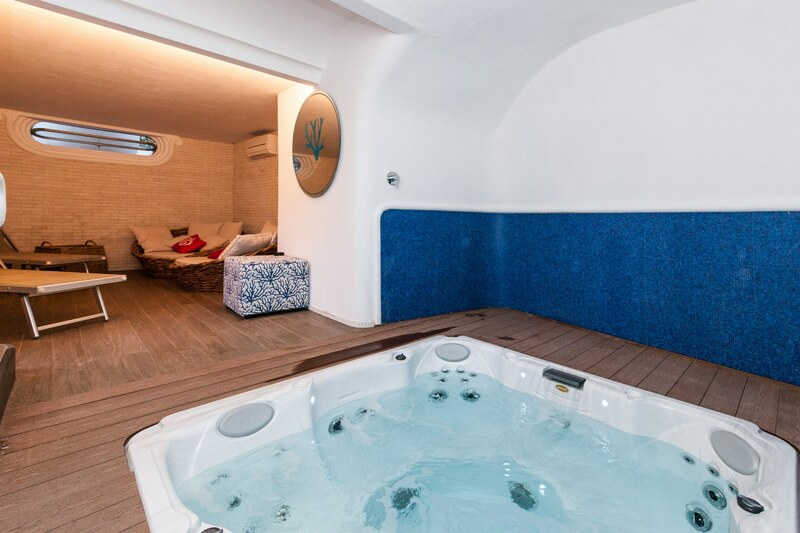 meters, 320 square feet) with Infinity swimming-pool with hydro-massage (4 x 3.80 m., 70 cm depth) that you will enjoy a breathtaking view of the sea and the bay of Marina del Cantone. 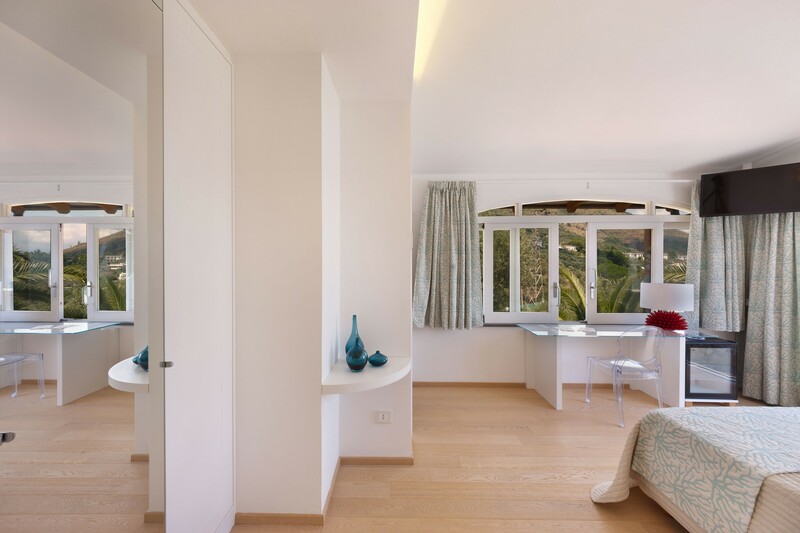 Two double bedrooms, each with en-suite bathroom and shower. 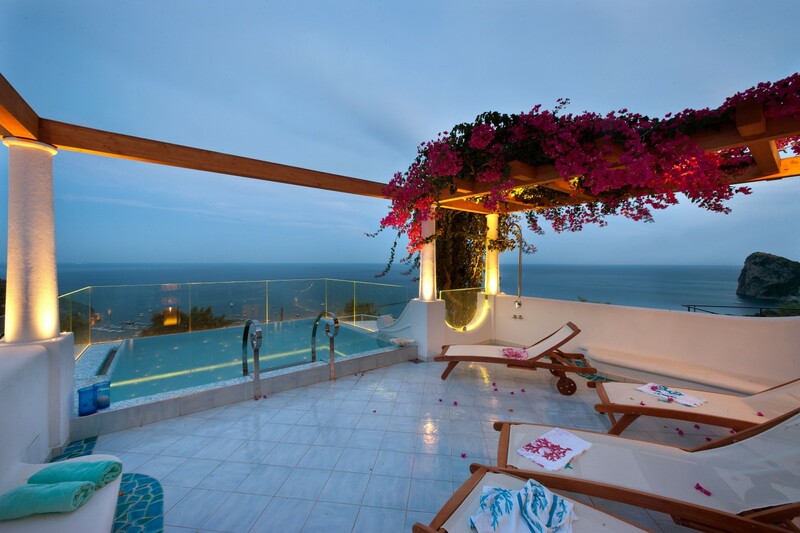 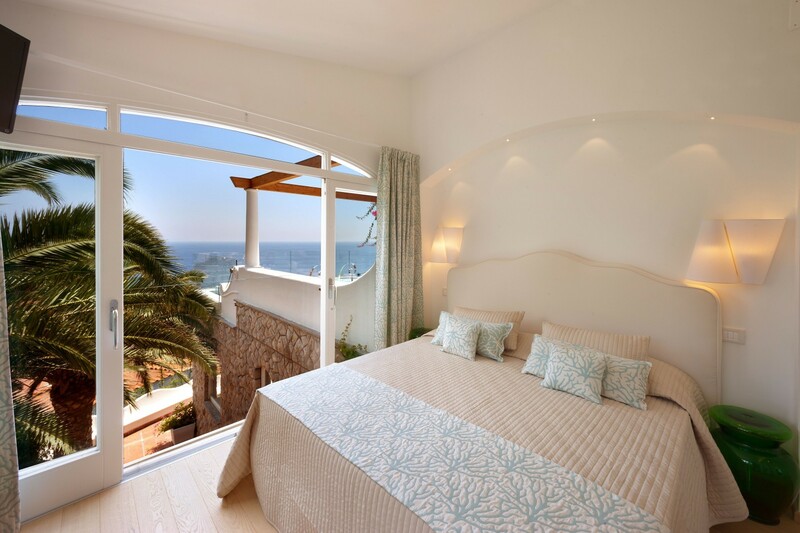 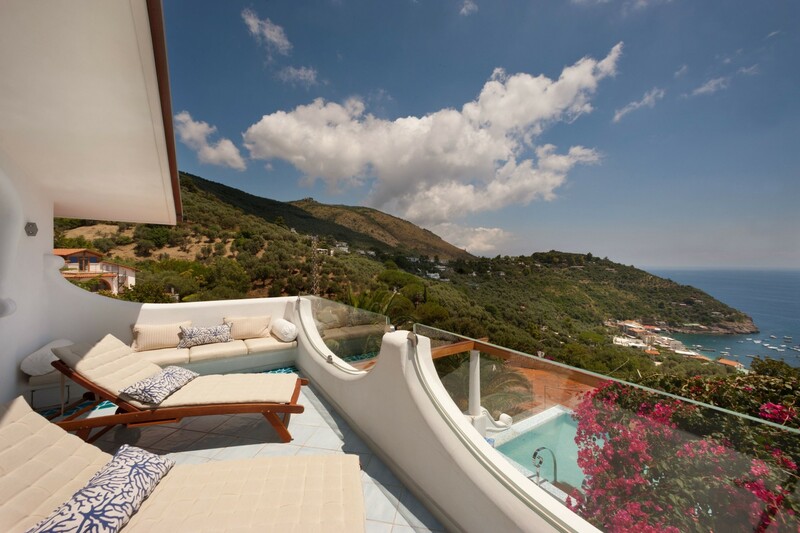 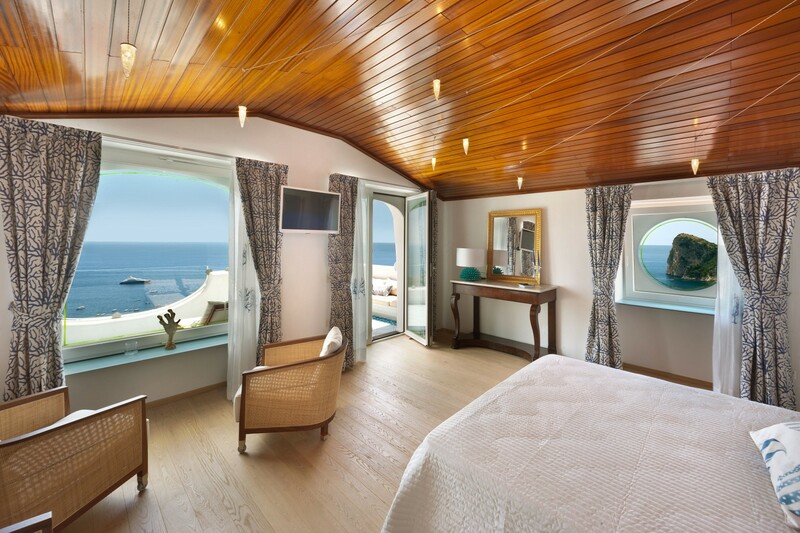 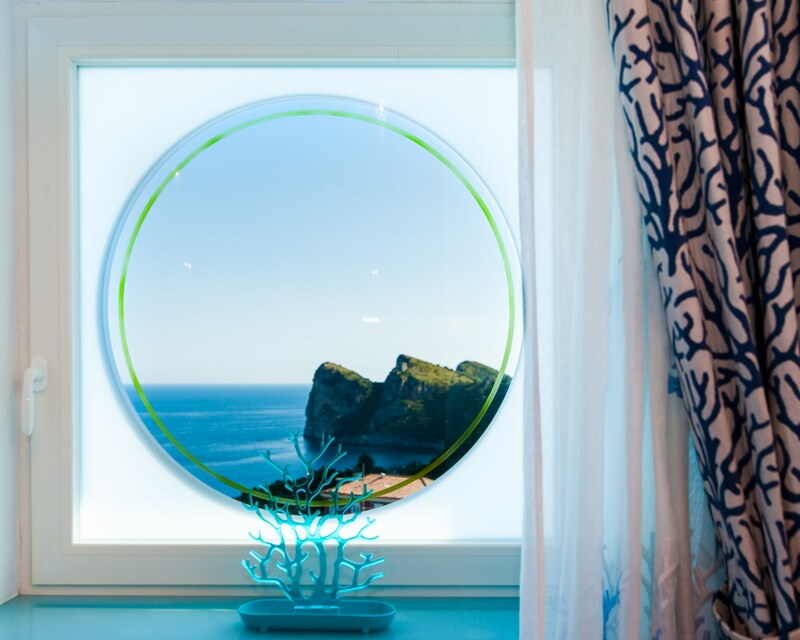 One of the bedrooms has access to the panoramic terrace with sea views. 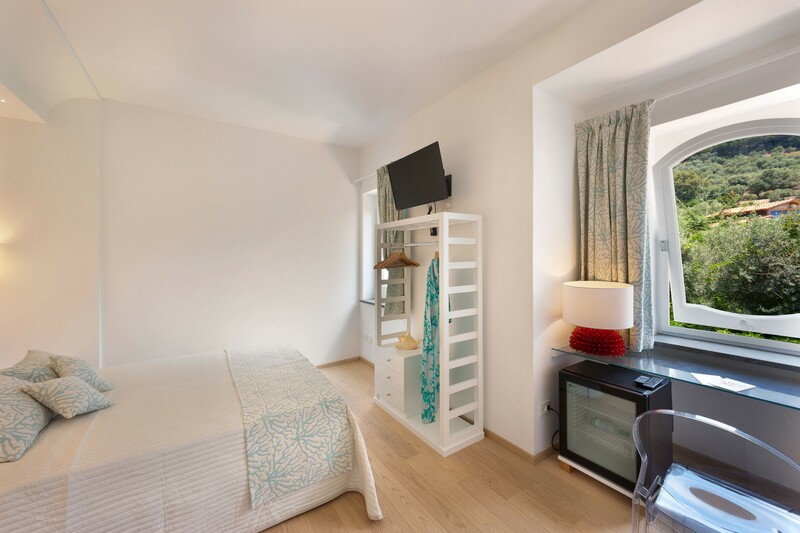 (Please note: three bedrooms have a safe; four have a mini-bar. 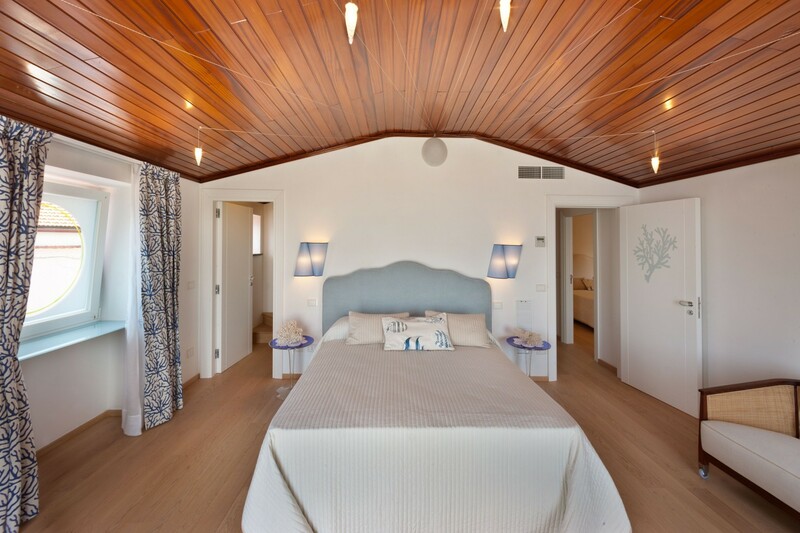 Four bedrooms have a king-size bed and one bedroom has a queen-size bed). 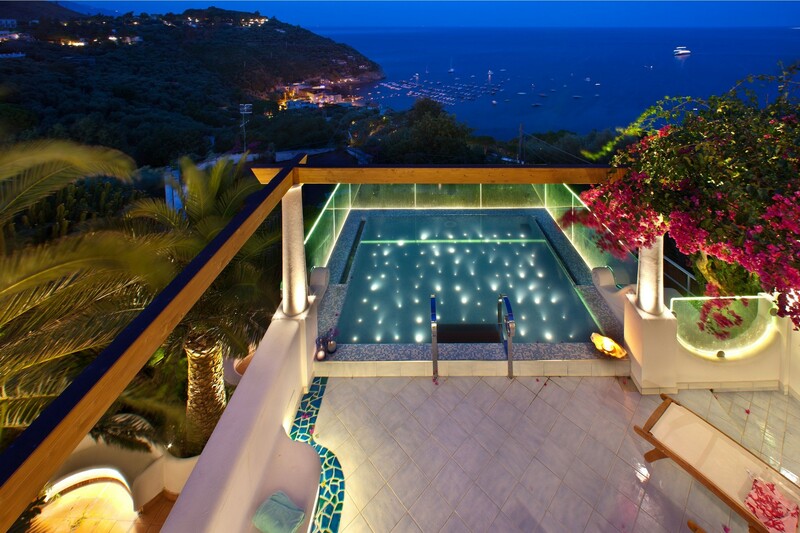 In this floor, you have access to the private swimming pool area. 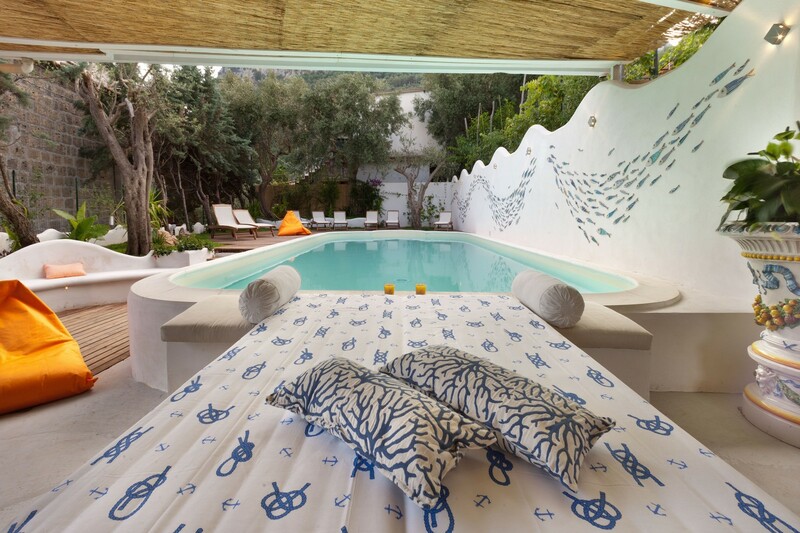 The swimming pool, 5×10 meters; 1.2 meters (4 feet) deep, enjoys an area with a comfortable long wooden table, chairs, sun umbrellas and sun lounge chairs, and an external shower. 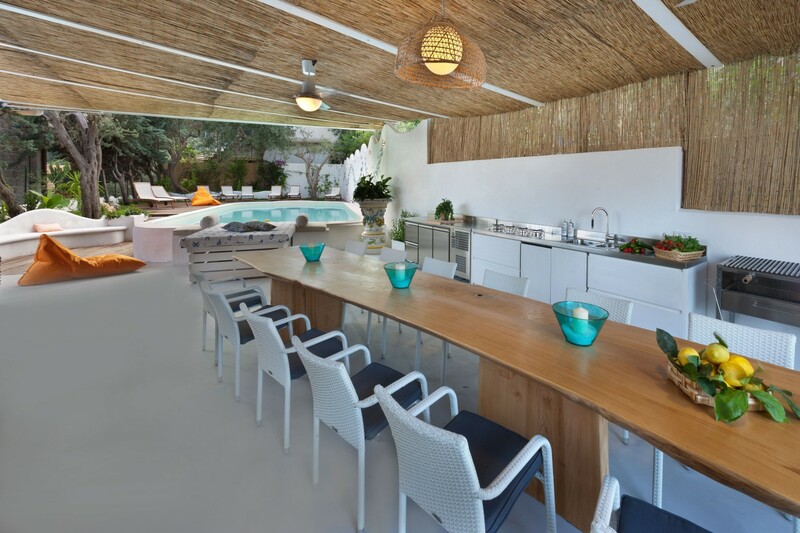 Here you will also find a portable barbecue, and a fully outdoor-equipped kitchen. 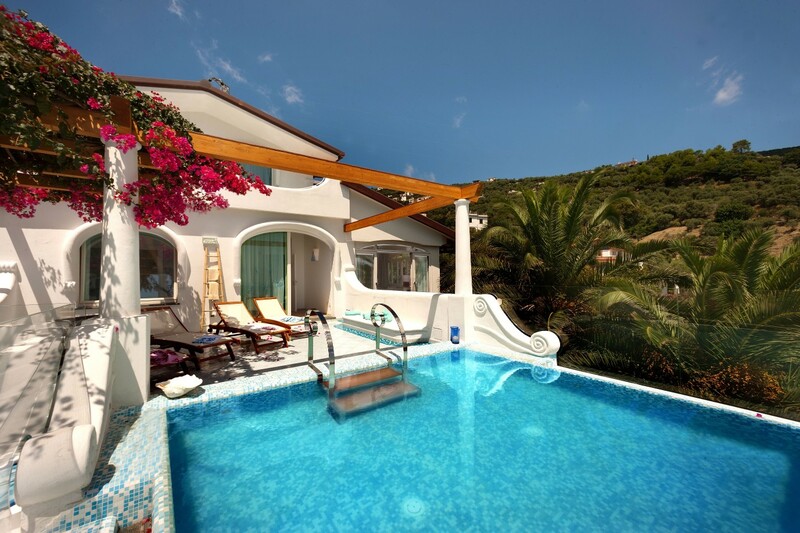 You can also reach the swimming pool from the entrance of the villa (ground floor), going up that includes approximately 15 stairway steps. 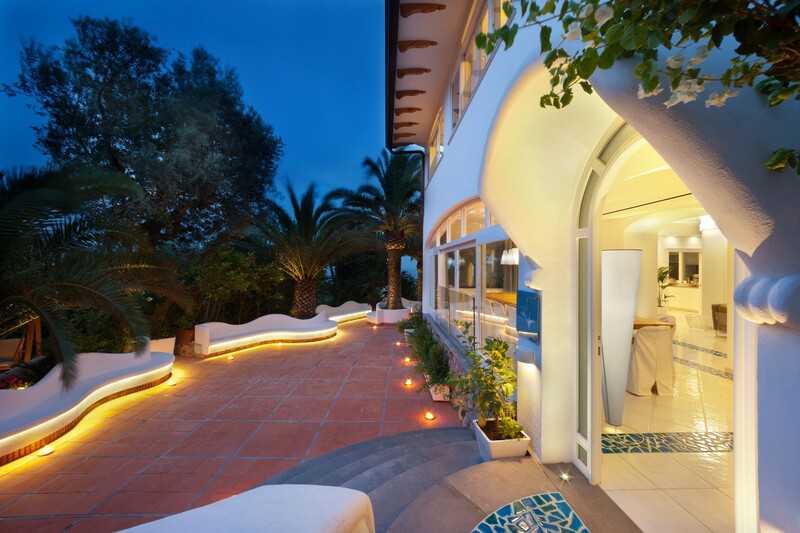 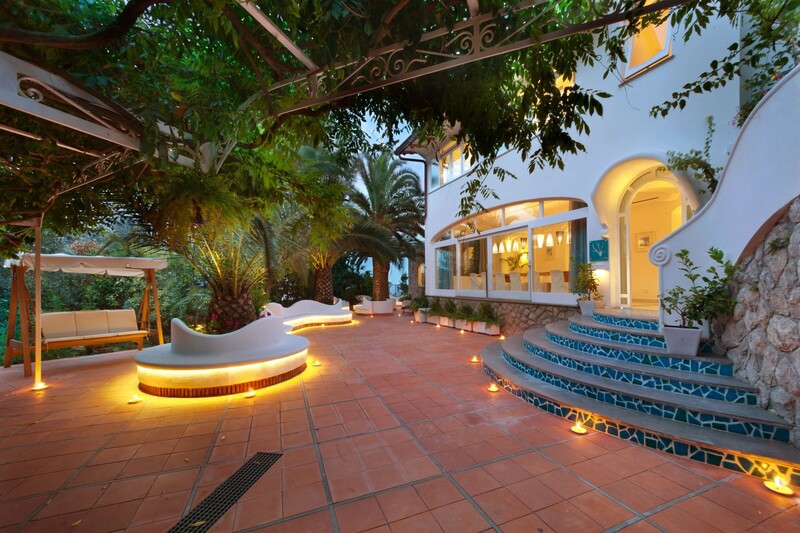 The entrance leads to a beautiful patio, about 200 sq. 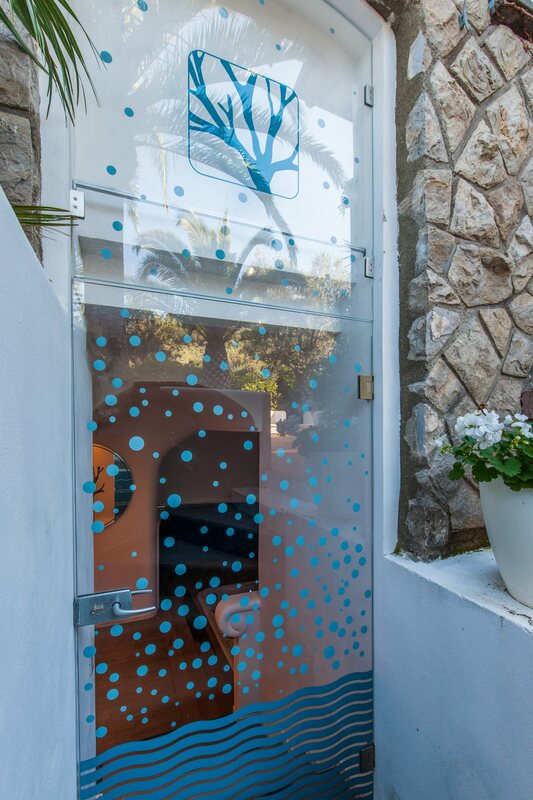 meters (2150 square feet) in size, equipped with comfortable tables, chairs, sun lounge beds, elegant stone benches, relaxation areas, and tables for outside dining. 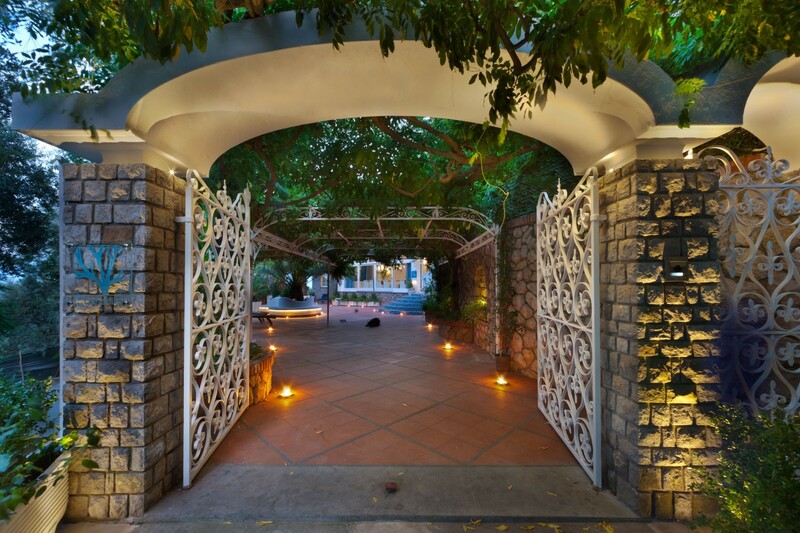 It is partly shaded by an elegant pergola and by tall palm trees. 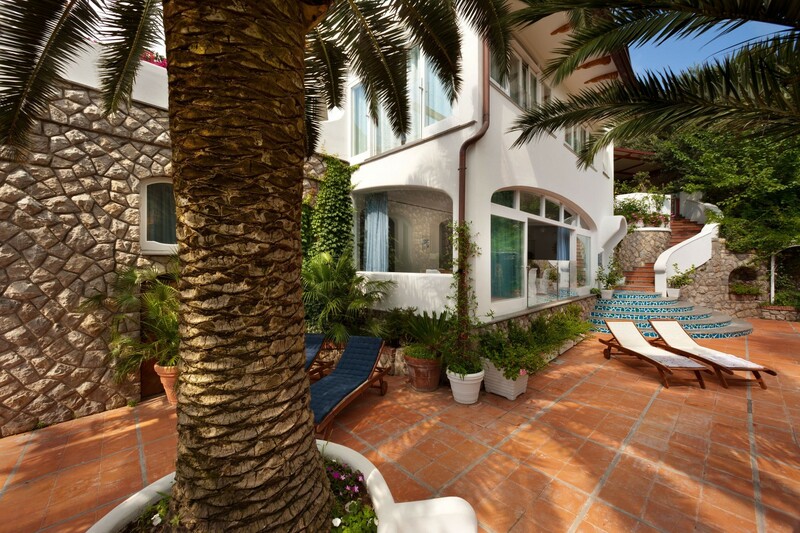 Accessed only from the patio. 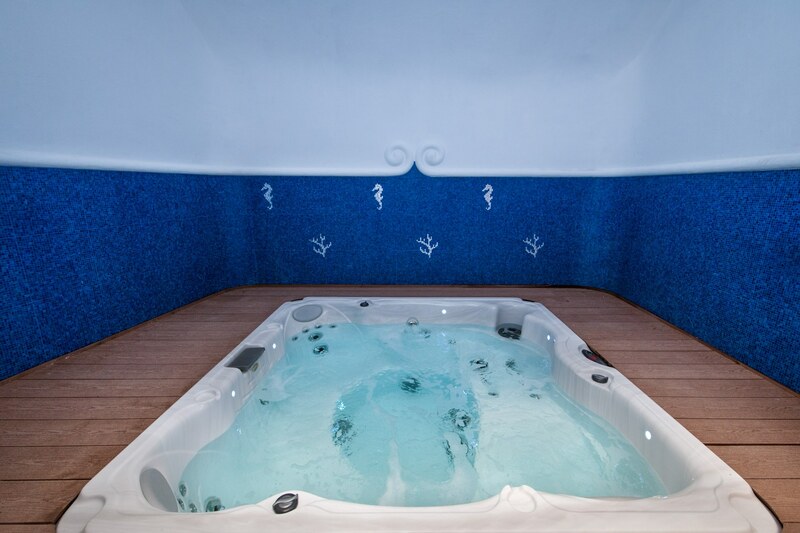 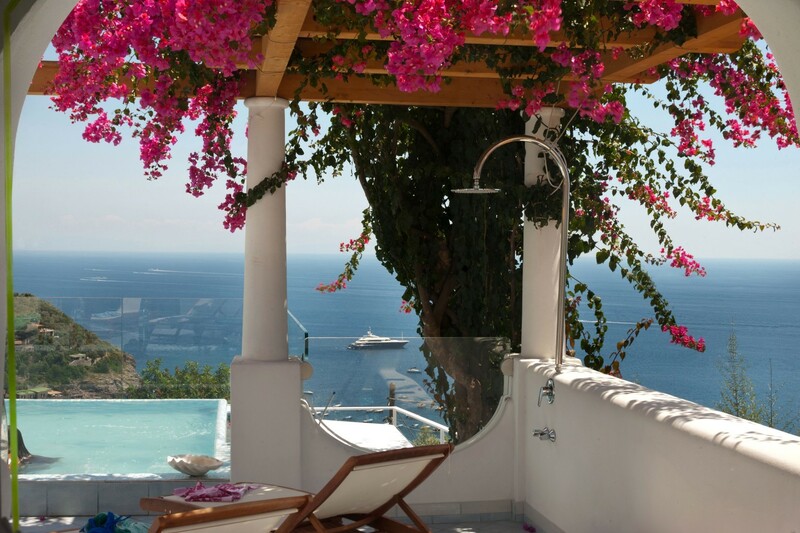 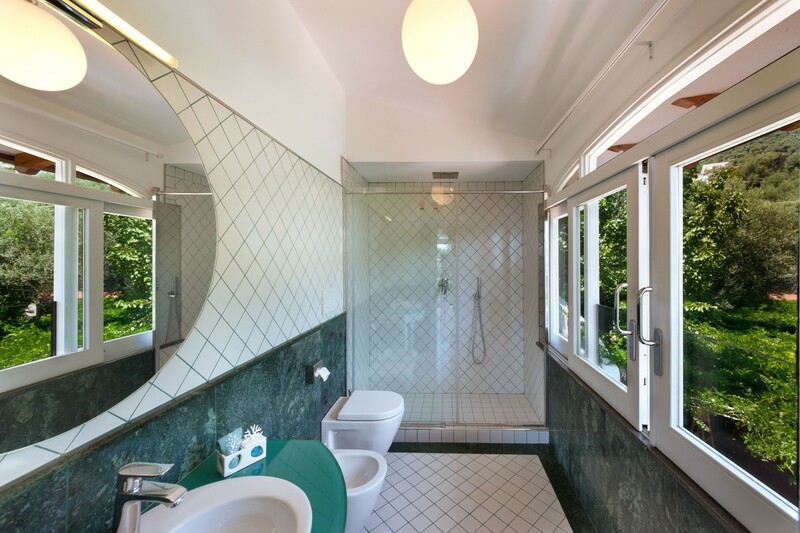 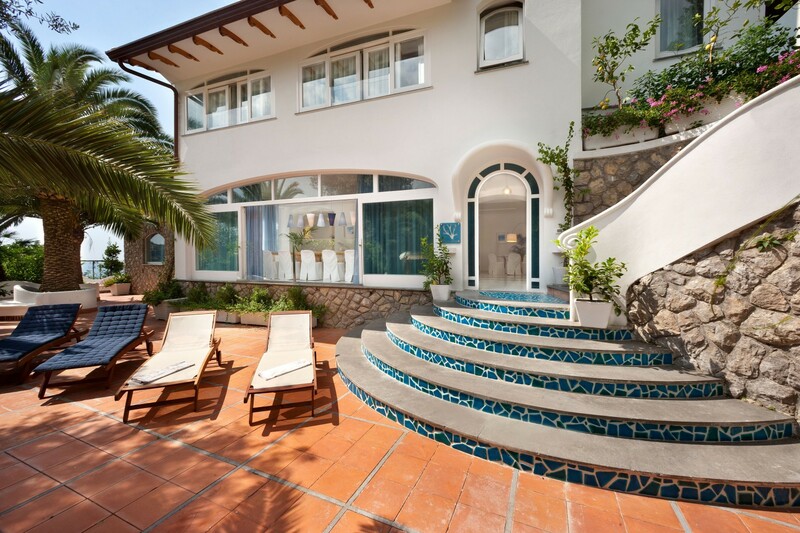 The villa has a private SPA Room, with Jacuzzi, Heated (213 x 213 x 91 cm depth, seating for up to 6 and 35 whirlpool jets). 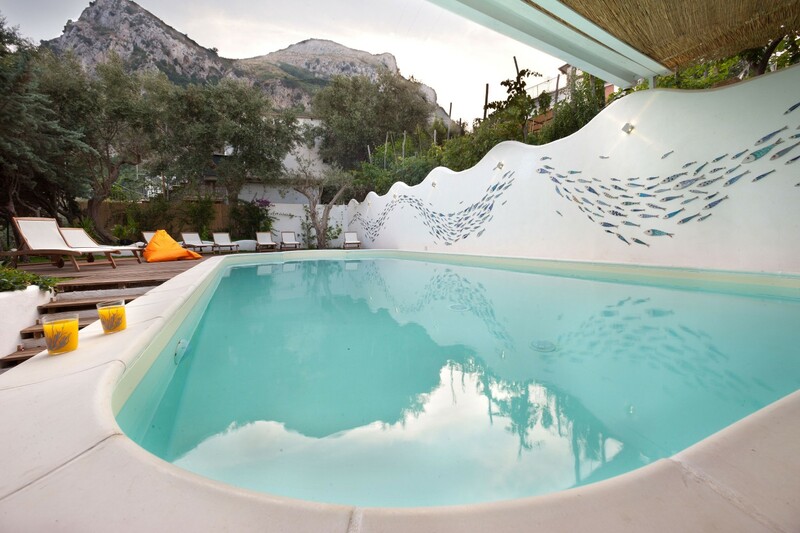 The pool can be heated, on request, between 30 – 35° (Celsius). 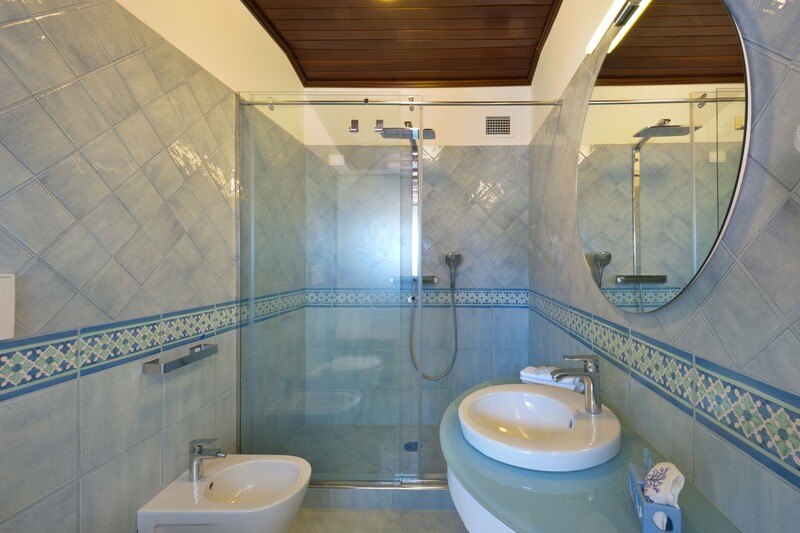 Specific water temperatures cannot be guaranteed and may vary due to the many environmental variables including humidity, ambient temperature, etc. 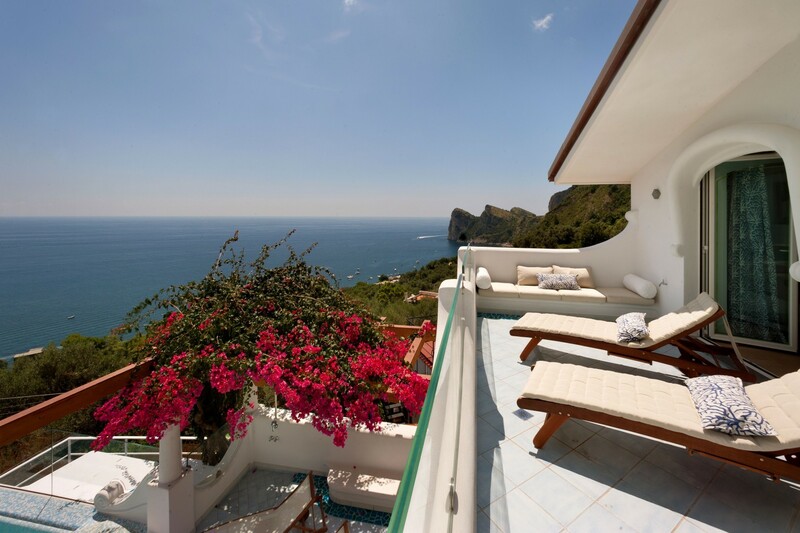 Please note: To stay at Villa Ulisse you will need a car. 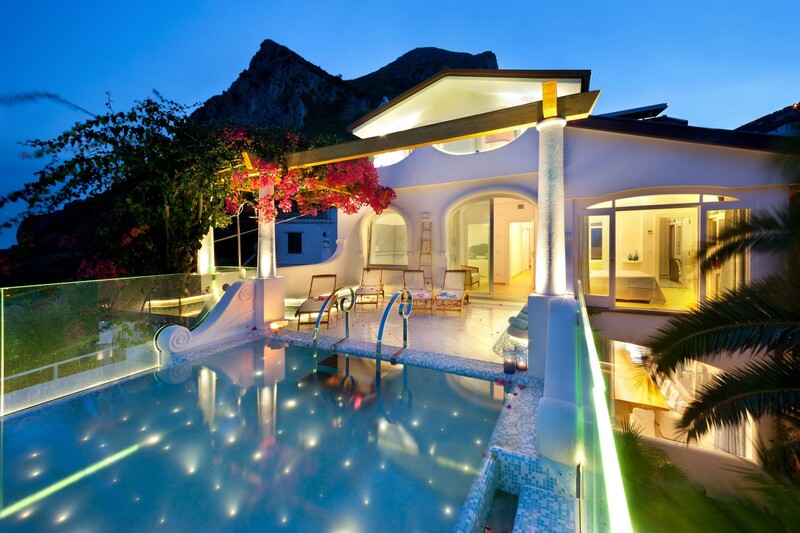 You will be able to park it on the premises (Parking lot). 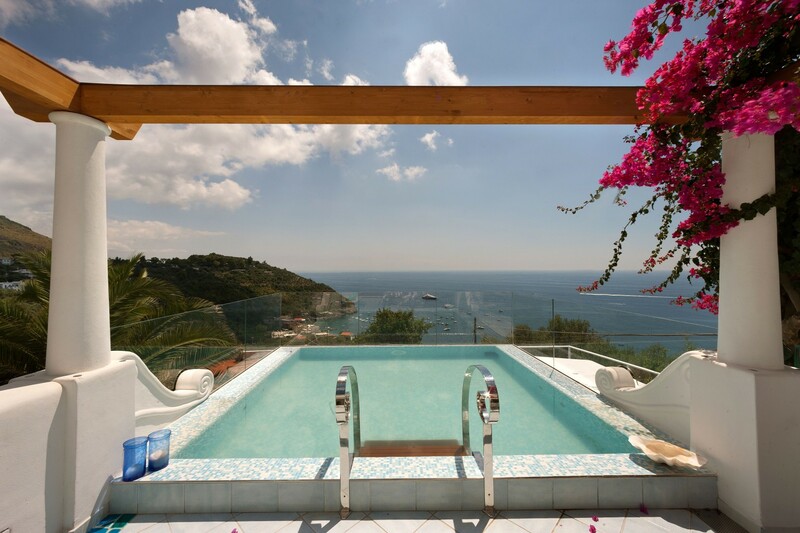 Access to Villa Ulisse is along 300-meter (uphill) from the main road, not suitable for large SUVs, motorhomes, caravans.